The well-supported 10/3 favourite Dark Vision earned quotes of between 14/1 and 20/1 for next year's QIPCO 2000 Guineas following his impressive display in the seven-furlong G2 Qatar Vintage Stakes. The two-year-old son of Dream Ahead was last entering the home straight, but made eyecatching headway in the final furlong towards the outside of the field to take the lead. Ridden by Silvestre De Sousa, Dark Vision ran on strongly in the closing stages to score by a length and three-quarters from the Alan King-trained Dunkerron in second. A delighted De Sousa was effusive in his praise of the powerfully-built colt. He said: "I wanted to be with the leaders, or just behind them, but they went a bit quick early on and Dark Vision is such a big horse that he was slowly into stride. 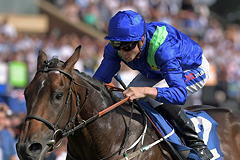 "I got a shuffled back a bit further than a wanted but he has galloped out well from four furlongs out. I was always happy with what he was doing during the race. "He is such a big horse and the other runner was half-trying to intimidate him. When he got his neck in there, he said "I'm going" and put the race to bed very quickly. "Cantering down, he didn't give me any feel at all - he never picked the bridle up - and he surprised me on the way back. I know he was favourite but needed to do a lot, when you look at the size of him on this track - it is such a sharp track, especially for two-year-olds over seven furlongs. "Dark Vision did marvellous because he is such a big horse and he put the race to bed very quickly. He is a lovely horse and I am sure that he will improve." Alan King was thrilled by Dunkerron's second-placed run in the seven-furlong Grade 2. Sent off a 9/1 chance, the bay colt led coming into the closing stages of the race before being passed by Dark Vision, who came with a wet sail to take the prize by a length and three quarters. "I think time will probably tell as to whether the winner is a proper horse. "Dunkerron is in the Gimcrack and going back to six shouldn't be a problem. He is in the Champagne [Stakes, Doncaster] as well. He will be going for those types of races. "I don't think for a minute we will go a yard beyond seven furlongs - it is new world for us." Harley, jockey of the Kuroshio two-year-old, added: "He picked up real good. "I followed William Buick [on Blonde Warrior] for a long time. When I asked my horse quickened, I thought whatever comes past me now is a good horse. "I didn't think I was going to be second, but Silvestre is the real deal. My lad has run a cracker and he has improved again. I think seven furlongs has done him no harm."